Fees associated with European PCT regional phase entry as well as other patent fees are available in the fee calculator. The PCT application should enter into the European regional stage within 31 months from the priority date. This term may be extended for two months by paying the fine. Request to grant a patent, a copy of the international application. The language of the proceedings is one of the official languages of the European Patent Office (English, German, and French). 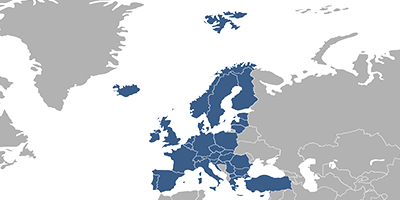 If the PCT application entering the European regional phase was filed in any other language, the translation of the application into one of the EPO official languages must be submitted at the time of the regional phase entry or within two months from the EPO notification provided that a corresponding fee is paid. After the decision to grant a patent is issued, the patent claims must be translated into two other official languages. A scanned copy of the Power of Attorney is sufficient to obtain the filing date. No legalization and notarization are required. A patent search is the obligatory stage in the course of European Patent granting procedure. It should be requested within 31 months from the priority date. A request to conduct a substantive examination of the European patent application should be filed within 31 months from the priority date. It is possible to request accelerated examination under PPH under certain circumstances. The official grant fee must be paid within four months from the EPO communication. Annuities apply to pending applications and are due from the third year calculated from the date of filing of the application. Annual fees may be paid within six months after the due date on condition of payment of a surcharge. 1 Online Database for European Patents (EP) Search.